It's been an amazing week for covers, with the pretty (and sparkly) covers for Now I Rise by Kiersten White and Crystal Blade by Kathryn Purdie making their debuts. Today, I'm featuring one that's been revealed for a while. I snagged a poster of this at BEA because I loved it so much. 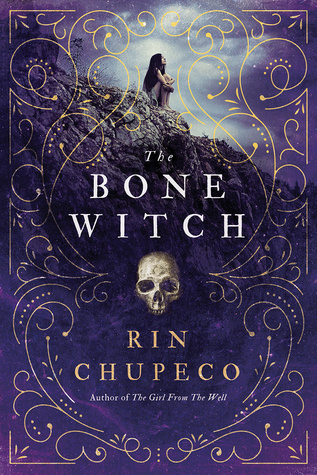 Yes, my friends, it's Rin Chupeco's Bone Witch. It diverges from both the Girl Face theme and the Shiny Object theme, bringing us a sleek and polished look with a simple color scheme and intricate overlay in contrasting colors. It looks like cut glass or the backdrop for a fortune teller. Just, magical. That skull in the middle is an edgy juxtaposition to the pretty-ness, and perfect for a book about necromancers. I wasn't crazy about Girl from the Well, but Chupeco's newest has me sold.